Today the Oceania Marina visits Klaipeda, Lithuania’s oldest city and largest port. Considering the total rainout yesterday in Estonia, it’s a relief to see the sun return. 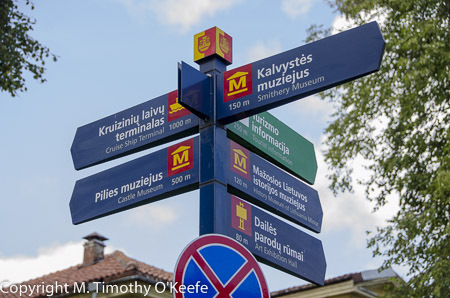 Lithuania is a country neither Tim nor I know much about except, like most Baltic countries, it was under Soviet rule from World War II until 1991.The Marina’s stop here is one reason we chose Oceania’s Viking Trails cruise. Klaipeda (pronounced “kli-pe-de”) was founded in 1252 near the Dane River, which flows directly into the Baltic Sea. The city’s name translates as “bigfoot” with a good story there. According to legend, the name originated when two brothers set out to find a location for a new city. One brother chose the longer route down the river while the other took a shorter route through thick marshland, where he died. When the first brother located the body, he discovered the print of an “enormous” (klaika) “foot” (peda) beside it. He decided to name the town Klaipeda “bigfoot” in honor of his sibling, using the killer’s description instead of his dead brother’s name; which seems the strangest part of the story. In Klaipeda’s Old Town, we will search for the steel sculpture called “dragon” which recalls this legend. The less imaginative claim Klaipeda’s name comes from “klaidyti” (obstruct) and “peda” (foot) due to the area’s once boggy terrain. With the Old Town just a 10 minute walk from the cruise port, we bypass the guided tours to explore on our own. A map of Klaipeda shows it should be an easy afternoon’s ramble. Klaipeda’s Old Town looks surprisingly familiar, as if we are in Bavaria or Switzerland. It’s due to the distinctive half-timbered style of several old warehouses built in the mid-1800’s. Known as fachwerk construction, the buildings are framed with heavy timbers arranged in horizontal, vertical and diagonal angles with white plaster filling the spaces between. It takes only a few minutes to walk to the heart of the city and Klaipeda Square, also known as Theater Square after the Drama Theater bordering one edge of the plaza. The square’s other three sides are lined with vendors in colorful stalls selling small trinkets and souvenirs. In the middle of Theater Square stands a sculpture of a woman known as Ann from Tharau. The monument is in fact dedicated to Simon Dach, a German poet born in Klaipeda in 1605. Dach fell instantly in love with Ann when he saw her for the first time. Unfortunately, it happened at Ann’s wedding and she was marrying a minister. The love-stricken poet dedicated a poem to her entitled Ann from Tharau. Dach’s poem turned out to be extremely popular. It was translated into several languages and eventually became a well-known folksong in Germany, Austria and Switzerland. In 1912, an artist from Germany came to Klaipeda to create the statue of Ann which also contains a small bas-relief of Dach. During World War II the sculpture was carted away by the Germans but recreated in 1990. Before exploring more of Old Town, we need to cash a few dollars into Lithuanian litas but we’re unable to find a bank that will do it. So we visit the casino across from Klaipeda Square. They not only are happy to change dollars into litas, they change our litas back into dollars later. From the square we walk heavily cobbled streets in search of the Dragon statue. Along the way we find a street lined with more fachwerk style buildings occupied by art galleries, boutique shops and small restaurants. I am beginning to fall in love with this town and its charm. Our map provides little help in finding the Dragon, supposedly nearby. We locate it in an unanticipated place. It’s not a big statue dominating one of the small city parks as we imagined. 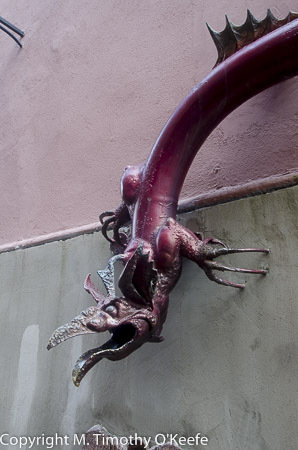 Instead, it’s hidden inside an old narrow street and the Dragon actually is the end section of a long drain pipe hanging from a building. Hardly what we expect. Although the dragon certainly looks fierce and dangerous, it’s only about three feet long. This is as much of a fairy tale as Klaipeda’s bigfoot legend. You’ll never see this dragon belch fire but its mouth will gush plenty of water every time it rains. More satisfying is the large and impressive is a section of the old earthen fort built in the 1700’s to defend the city. As a port city, Klaipeda held considerable strategic value and the ramparts reaching almost 12 feet high emphasize its importance. As at fortifications elsewhere in Europe, ditches were dug around the walls to create a moat, with the Dane River providing it a ready water supply. Although the complex network of irregular shaped walls (called bastions) was considered on par with many great castles, they were soon neglected, allowed to fall and crumble. In the 1990’s, a section of the fortress was restored on Jonas Hill at the end of Turgaus Street. We view the surviving bastions from a high vantage point. The moat beneath the grass-covered walls, filled with fresh water from the Dane River, resembles a small lake. Overall, the complex looks like an appealing park. It’s time to move on to what some call Klaipeda’s New Town with its main business district.